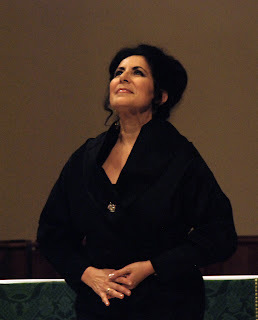 Soprano Frances Ginsberg was the featured performer at Sweet Appreciation IV, a benefit held on October 14 in support of the Rusty Magee Clinic for Families and Health. Ms. Ginsberg, who is based in Milan, Italy, and performs all across Europe, was accompanied by Maestro Marco Munari of La Scala, Maestro Joshua Greene of the Metropolitan Opera and pianist Allison Leyton-Brown in an eclectic program that included music by Verdi, Puccini, Ravel, Rodgers and Hammerstein and Rusty Magee. Frances Ginsberg’s emotionally generous and sensitive singing has touched the hearts of audiences worldwide since her New York City Opera debut in 1986, when Beverly Sills named her Debut Artist of the Year. The concert marked the first time ever that Maestros Munari and Greene have appeared on stage together, and also was Maestro Munari’s American debut. The benefit was held at Holy Apostles Church on Ninth Avenue and 28th Street, with an after show party with Mary Testa, Nancy Giles, Magee Hickey and the friends of Rusty Magee at Porters Restaurant on Seventh Avenue between 22nd and 23rd Streets. The Rusty Magee Clinic for Families and Health was named in October 2006 to honor the memory of Rusty Magee, composer, lyricist, and comedian for film and television. The Clinic, which provides crucial services to couples and families facing chronic or life-shortening medical illness, works to help others mirror the courage, good humor, and generosity of spirit Rusty Magee demonstrated during his long battle with cancer. During the last six months of his life, no matter how ill he felt, Rusty Magee came to the Ackerman Institute for the Family every week with his wife, Alison Frasier, also a performer, to give and receive the gift of relationship. The Rusty Magee Clinic for Families and Health is a true testament to the belief that while death may end a life, it never ends a relationship. In addition to offering therapy services, the Rusty Magee Clinic trains allied health professionals. It is the only clinic of its kind in the tri-state area, and is recognized by health care professionals as the place to refer patients and families for needed emotional support, relationship solutions and the recovery of resilience in the face of serious illness and loss. “One of the things we try to do at the Rusty Magee Clinic is help families continue with their lives,” Lisa Lavelle, Assistant Director of the Center for Families and Health, explained. “When a family member has a serious illness, the family has to cope with it, but it doesn’t have to dominate everything they do. They can still have a more resilient life.